VOTERS in the 26 Counties have rejected the Lisbon Treaty by a decisive margin. 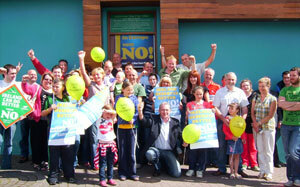 The result is a major victory for those, including Sinn Féin, who campaigned for a ‘No’ vote. The treaty was defeated by a margin of 53.4 per cent to 46.6 per cent, with 752,451 people voting ‘Yes’ and 862,415 voting ‘No’. The turn-out of 53 per cent was higher than in either of the Nice Treaty referendums. Taoiseach Brian Cowen said he respects the result but described it as “a source of disappointment” to himself and the Government. Labour Party leader Eamon Gilmore, who had campaigned for a ‘Yes’ vote, said the Lisbon Treaty is now “dead”. “I do not think there is any question of the treaty being put a second time to the people,” he said. But European Commission President José Manuel Barroso insisted that the treaty is still alive and urged other EU states to continue to ratify it despite the Irish ‘No’ vote. He said Brian Cowen had told him in a telephone call that the treaty is not yet dead. Barroso said he also believes the treaty “is alive and we should now try to find a solution”, saying that 18 of the 27 EU member states had ratified it. He said Brian Cowen would be invited to present his views on the referendum result and how best to move forward at a two-day EU summit in Brussels starting this Thursday. Speaking following the official announcement that the Lisbon Treaty had been resoundingly rejected by voters, Sinn Féin MEP Mary Lou McDonald said Sinn Féin was seeking a meeting with Brian Cowen. This followed the Taoiseach’s comments that he is to consult widely at home and abroad. At his first European Council meeting this week, she said, as Taoiseach, Brian Cowen should set out in clear and unambiguous terms the concerns raised by the Irish people and the need for these concerns to be properly addressed. Mary Lou McDonald said that, throughout this referendum campaign, a number of specific issues came up over and over again – Ireland’s loss of power in Europe including the loss of a permanent Commissioner, neutrality, the race to the bottom in wages and conditions and the opening of key public services to competition. She explained that many of these same concerns were raised by the people of France and the Netherlands when they rejected an almost identical package in 2005. And they have been raised by many political voices across the EU over the last 12 months. “Ireland’s place in the EU is secure. Suggestions from a small number of EU leaders that they can blindly continue on with the Lisbon Treaty are not just undemocratic but also untrue. 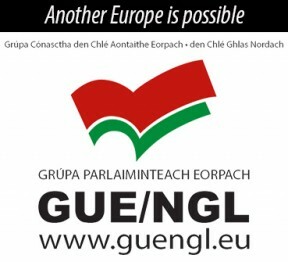 The Lisbon Treaty needs the support of all member states to come into effect. “The people have been asked on three occasions their views on the content of this treaty and on three occasions it has been rejected. European leaders now have an opportunity to listen and to address these genuine concerns. “There is also a responsibility on all of us who believe that a better deal is possible, to support and assist the Government in their task. Sinn Féin wants to be constructive. • Opt-outs from expenditure on nuclear power and military capabilities.